Oceanus magazine story featuring REMUS. REMUS discovers dangerously shallow water near a shipping channel into Antarctica. From Oceanus magazine. 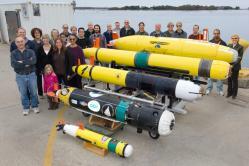 REMUS AUVS are commercially available at Hydroid, Inc. located in Pocasset, MA. 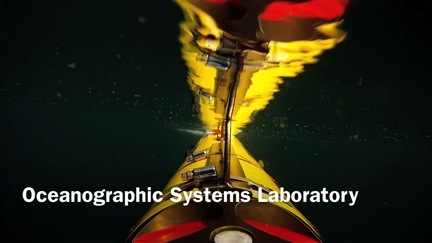 At the Oceanographic Systems Lab (OSL) a team of engineers, technicians and staff define Autonomous Underwater Vehicle (AUVs) concepts and build them into reality. Starting off with a small 100 meter depth rated two person portable vehicle just over a decade ago, our team now designs larger more powerful vehicles designed to visit depths up to 6000 meters. Our mission is to provide the latest and most cutting edge technology for AUVs and their objectives relating to science and military applications. These low-cost autonomous underwater vehicles are designed by OSL personnel to operate simply with a laptop computer. At less than 80 lbs, the lightweight design facilitates launch and recovery operations. A standard configuration carries an up- and down-looking Acoustic Doppler Current Profiler (ADCP), sidescan sonar, a CT profiler, and a light scattering sensor. 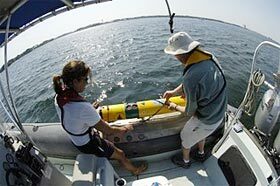 Many other instruments have been integrated since its inception, including fluorometers, bioluminescence sensors, radiometers, acoustic modems, forward-looking sonar, altimeters, and Acoustic Doppler Velocimeters (ADVs). 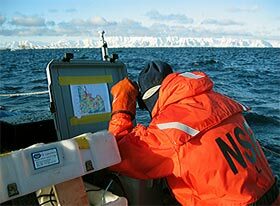 REMUS can also carry a video plankton recorder, a plankton pump, video cameras, pop-up cameras, an electronic still camera, and most recently, a towed acoustic array, making it a versatile tool for any mission. Because REMUS is so easy to use, a large number of non-technical personnel have been taught to operate the vehicle. This simplicity is evident in its mission programming, operation, recovery, and data downloading and analysis. Routine maintenance consists of washing it down with a hose and recharging the batteries, which does not require opening the housing, but merely plugging in a cable and pressing a button. As a result, it is an extremely reliable vehicle. REMUS has surveyed areas up to 80 kilometers at 3 knots or more than 100 kilometers at lower speeds.A standard vehicle equipped with an up/down-looking ADCP and sidescan sonar can run for more than 8 hours at 5 knots, or up to 20 hours at 3 knots. Unmodified, the REMUS vehicle is 52 inches long with a body diameter of 7.5 inches. The vehicle's length may be increased to support any payload within reason. Because REMUS is small, it can easily be transported in a compact car and even Fedexed overnight, then launched and recovered from a small vessel. Special handling equipment is not required. Although small in size, REMUS is currently configured to support a variety of sensor packages. The REMUS control computer is based around PC-104 technology. The CPU sits on a custom motherboard with eight 12-bit analog to digital channels, I/O ports, power supplies, and other interface circuitry. The user interacts with REMUS through its diagnostic software and communicates via an RS-232 serial link. The REMUS vehicle interface program (REMUS VIP) is designed to run on a laptop equipped with Windows. The diagnostic software performs several functions including: displaying the status of all REMUS sensors; providing direct control of the vehicle via buttons and sliders; downloading mission files that tell REMUS the route to follow and the location of transponders; displaying the status of all major sub-systems and diagnostic messages; and playback of telemetry data as recorded by the vehicle during a mission. This allows users to operate and maneuver REMUS while obtaining data that can be plotted and displayed or exported in a variety of formats. The Semi-Autonomous Mapping System Vehicle REMUS 6000, the Tunnel Inspection Vehicle (TIV) and REMUS 600 are recent additions to the REMUS family at WHOI's Oceanographic Systems Laboratory. These vehicles demonstrate the manner in which REMUS technology can easily be adapted to larger vehicles better suited to performing more specialized tasks. Any vehicle that is larger than REMUS has the ability to travel farther, go deeper, and carry a more complex set of sensors. Larger AUVs like REMUS 6000, TIV and REMUS 600 are designed for a greater depth rating and payload capacity than the standard REMUS-100. And, yet, all vehicles use the same VIP (Vehicle Interface Software) and auxiliary tracking equipment. As the largest of the four REMUS variants, REMUS 6000, demonstrates what happens to a REMUS vehicle when you retain its shallow water performance and a similar sensor suite, but design it to be able to operate in the deep ocean. The REMUS-6000, weighs 817 kg and may be operated to a depth of 6,000 meters. 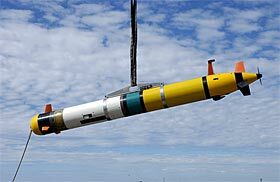 In March of 2003, REMUS-6000 completed a record AUV dive to 4,964 meters that lasted up to 13 hours. Another larger version of REMUS, TIV was developed in 2003 for New York City's Department of Environmental Protection. OSL engineers at WHOI designed TIV to navigate and document the condition of a 72-km aqueduct that provides 65 percent of the drinking water to the metropolitan NYC area. The vehicle successfully navigated through the water-filled tunnel while taking and recording about 186,000 digital still images of the interior tunnel walls during its 15-hour trip. The most versatile addition to the REMUS family is the REMUS 600 commonly referred to as the 12.75 because of its hull diameter. It can accomodate a large payload and can run for three days. Two REMUS-3000 have been designed and build in our lab. These vehicles have similar design concepts to the REMUS-600, but their hulls are fabricated out of titanium enabling it to go to deeper depths up to 3000 meters. Rigid Hull: Lowest possible drag, highest battery and payload capacity, greatly reduces the number of launch and recoveries. Small diameter reduces drag, increasing endurance. Simple, built-in battery chargers, only power supply is required. Sealed system, no need to open hull or disassemble vehicle on deck, increases reliability.